Some of the Church’s top legal minds will gather in Adelaide today to hear from Vatican representatives and local canon lawyers at the Canon Law Society of Australia and New Zealand’s annual conference Source: The Southern Cross. More than 100 people working in the areas of canon law and marriage tribunals for the Church in Australia, New Zealand as well as the US, Canada, Fiji, Tonga, PNG and Scotland are expected to attend the three-day conference. 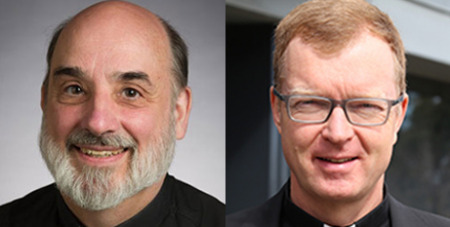 “Current Issues in Jurisprudence and Practice” will be the topic of the keynote address by Fr Robert Geisinger SJ when the conference opens today. Fr Geisinger, who holds degrees in theology, philosophy and canon law, serves in the Vatican as the promoter of justice at the Congregation for the Doctrine of the Faith. He teaches at the Gregorian University and is a consultor to the Congregation for Institutes of Consecrated Life and Societies of Apostolic Life. Other keynote speakers include Fr Hans Zollner SJ, a German theologian and psychologist who has been a member of Pope Francis’ Pontifical Commission for the Protection of Minors since 2014 and is head of the Centre for Child Protection at the Gregorian University in Rome. Fr Zollner, whose visit to Adelaide follows a two-day seminar in the Wollongong Diocese, will explore theology, psychology and canon law issues relating to child sexual abuse. Fr John Salvano, dean of St Patrick’s Cathedral in Melbourne and judicial vicar for the Marriage Tribunal of Victoria and Tasmania, will tackle the issue of arranged marriages and how they can be identified in the Australian context. Finally, Sr Mary Wright IBVM will look at the challenges facing canon lawyers today. Sr Wright advises leaders of Church institutions on canonical governance issues, particularly in the US and Australia. President of the law society, Sr Maria Casey RSJ, will open the conference, with proceedings concluding with a Mass at St Francis Xavier’s Cathedral followed by the annual conference dinner on Wednesday. Sr Casey said the conference would be a “rich time” for sharing information, discussing canonical issues, networking and “learning from the experiences of others”.